Are you a BA? A UX? Are you wearing both hats (or maybe more) in your project? Find out how the boundaries of Business Analysis (BA) and User Experience (UX) roles in Life Sciences overlap and how they can contribute to deliver value to both the business and users. In recent years Business Analysis and User Experience Design have been in demand in Life Sciences organisations. Companies are increasingly relying on these two complementary disciplines when it comes to designing and implementing digital solutions. Business communities are actively taking crossover initiatives to support the relationship between UX and BA practices because these professionals are increasingly sharing tasks and responsibilities in the delivery of solutions. It is clear that the two disciplines can overlap in supporting organisations in the era of digital transformation. However, the boundaries of these two roles can be unclear, which could blur the understanding of who is doing what, and risks generating a sense of us-and-themness. And if the BA or UX handbooks provide well-crafted definitions, their roles in life science organisations are not always as well defined (see Table 1). The culture and structure of an organisation influence how BA and UX work: reporting structure, cost center, communication and collaboration culture and so on. BA and UX both contribute to understanding what problem the business is trying to solve. This extends to who will be affected and what part of the system needs to be changed in order to bring value to the business and the users. To generate insights about requirements, BA and UX both draw on common tools and techniques based on research, products or facilitation like interviews, observation, personas or workshops. When it comes to designing, which is another shared task between the two roles, they might end up using other common methods and techniques like brainstorming and prototyping, although each discipline excels in different aspects of the solution definition, BA being generally word-based, whereas UX tend to capture requirements more from the user’s perspective. 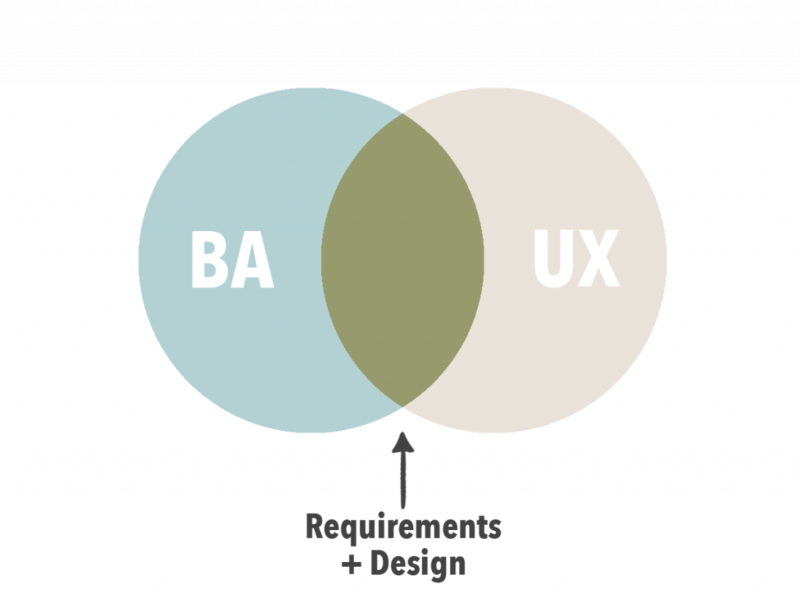 The main difference between BA and UX is the direction from which they approach the problem space to elicit and gather requirements. The emphasis for the BA is understanding the problem space from a business perspective and translating concepts into actionable business requirements, defining business objectives and managing stakeholders expectations around them. This contrasts with UX which focuses on qualitative and quantitative user research to identify the motivations, needs, barriers, pain points, and context from the perspective of the user, making sure that user requirements are validated and understood. In Life Science organisations understanding the science is often the starting point. This understanding and the supporting evidence from high quality data is crucial for design of the problem space. To respond to this requirement, BA and UX need to work with scientists to iteratively analyse, define and validate requirements that guide the engineering team to deploy agreed data standards for creation of predictive models. It is worth noting that many BA’s in the life sciences tend to come from a scientific background and provide key insights as domain experts to support execution of a project. Misconceptions about their roles (i.e. see the myths on UX) might interfere with the stakeholders and team’s dynamics and expectations. Sometimes it is not clear what is expected from them, what is the spectrum of their competences, or their impact in solving problems. They can then take the initiative to reach out or train the organisation about their discipline, thus raising awareness, increasing the organisation’s capabilities and helping to debunk those myths. Conflicts might also arise between competing priorities, when e.g the business priority is to deliver a working business/scientific solution that is not fully user-friendly, and the other way around, when user requirements are signed off but might not make it a sustainable business solution. This happens when stakeholders are pushing for the adoption of a ‘cool’ new solution that is not either meeting user needs or justified by a real business case, generally a symptom for untested hypothesis or fuzzy requirements. Testing is fundamental in checking hypothesis and that the proposed designs are getting the requirements right. Whatever focus BA and UX might lean on, the team needs to be explicit and have a plan, agreeing on what it means to perform tests and have a solid definition of ‘done’. Let’s take for instance functional testing: it will verify that the solution meets its specifications, ignoring if it’s working for the user, which is achieved through usability testing. Different testing techniques like these ones will generate different types of considerations that will affect the direction of the project. BA’s are close to the business processes and stakeholders so they understand how the business works. They gather business requirements so UX experts need to be careful to avoid duplication. A good BA understands the business value provided by a solution. On the other hand, UX can be a neutral party within the business, who can advocate for the user, have a fresh set of eyes and a different perspective on data, design and priorities. Ironically, their biggest victories might come from uncovering the lack of value or asking for better clarity about the business case for an initiative. Life sciences organisations can benefit from the effective application of BA and UX skills. 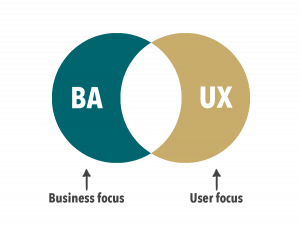 By covering respectively the business and user experience, BA and UX experts can complement each other to facilitate the success of an initiative. Whilst they might not always share the same view or wear multiple hats, effective BA and UX is likely to be most impactful when both collaborate closely together, sharing open communication and clearly defined responsibilities and accountabilities. Acknowledgments: I would like to thank our UXLS project members for the healthy discussion and contributions to this article. In addition I thank Liz Calder, Nick de Voil and Francis Rowland for their insights and contributions to this article.